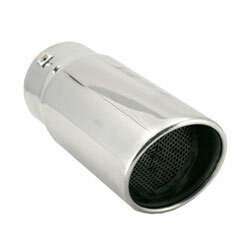 Spectre bolt-on universal exhaust tips are a great cosmetic add on for your exhaust system. Our universal exhaust tips feature a polished stainless steel finish for long lasting looks and a resonated interior for great sound. This exhaust tip is designed to fit 2.75 inch to 3.75 inch exhaust tubing and is held in place by the 3 mounting screws or can be tack welded. This exhaust tip also features an aggressive slant cut design with a 4.5 inch outside diameter body.